The past two weeks flew by! 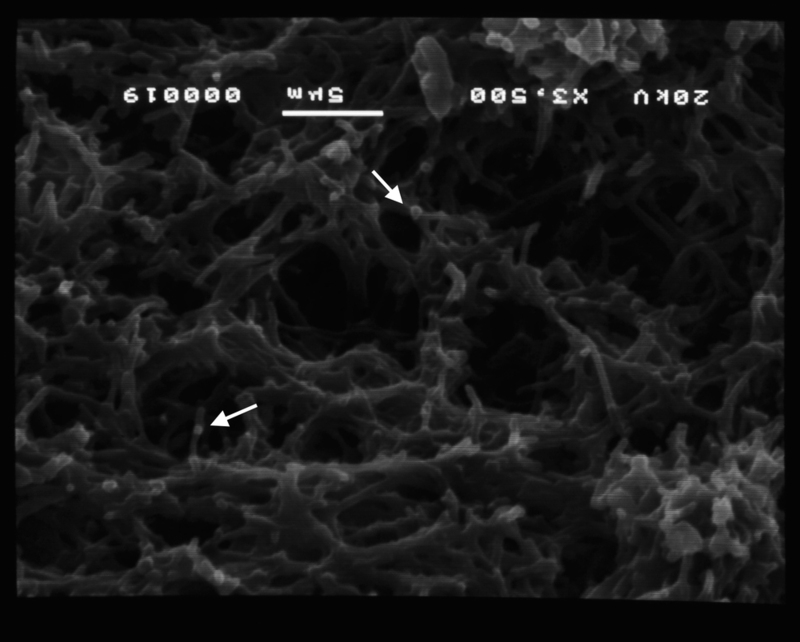 We're finally getting the hang of imaging biofilms. We couldn't have made it this far without the help of Dr. Sherman Hendrix (GBC Emeritus) and Dr. Titilayo Shodiya (University of Michigan). Sarah's SEM images are at the bottom of this post. Nene is "plugging" away on the pulse field gel project. She's been making agarose plugs, lysing cells, and running gels non-stop. We're slowly but surely making improvements to our protocol. Nene has isolated what we think is a large linear plasmid from Microbacterium oxydans. She's working on optimizing the agarose plug protocol so we can get a nice clean band. Check it out below! 1.0% Pulse Field Gel prepared and imaged by Nene Sy. Low Range Marker reflects kilobases. Nene has optimized the pulsed field program to give better resolution in the 50-200kb range. We're working to get rid of the smearing around the band! These are Sarah's latest SEM images below. These look much better than the images we posted last week. Sarah included alcian blue in the primary fixative and let the samples air dry for 2 days after hexylmethyldisilazane drying. We still have to figure out how to get rid of those pesky horizontal lines at higher magnifications. If you have suggestions, please leave them in the comments!